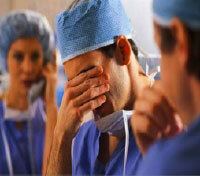 Home > Articles > Medical Errors > Will apologies to patients drive med mal attorneys out of business? Studies have shown that the primary factor in a patient’s decision to pursue a medical malpractice case is a lack of communication from the provider after an unexpected outcome or undesirable result has occurred. Often a patient’s decision to sue was influenced not only by the original injury but also by insensitive handling and poor communication afterward. The 2007 JCAHO National Patient Safety Goals, which affect all accredited healthcare facilities, were released in June 2006. The focus on patient safety continues with Goal 13: “Encourage patients’ active involvement in their own care as a patient safety strategy” 13A: “Define and communicate the means for patients and their families to report concerns about safety and encourage them to do so.” 3 The subject of patient safety has come out of the closet. The advice to disclose errors challenges the traditional legal view to remain silent when a mistake has reached a patient. That advice serves to block the ability of fellow doctors and nurses even in the same facility to get the clinical details of what went wrong in time to change their system to prevent a repeat tragedy.11 The process of apologizing and taking responsibility for errors is spreading. As of December 2005, nineteen states had enacted legislation that prohibits apologies from being used against a doctor in court. Refer to www.sorryworks.net for more information about efforts to foster disclosure and provide apologize to patients. The value of offering apologies and the risks of these statements being seen as admission and used against the healthcare provider in court will be resolved as more healthcare providers begin to understand the benefits of being open and truthful with patients about medical errors. However, the fear of being open and the impulse to conceal will continue to influence disclosure, and keep patients heading to attorneys. Porto, G. “Disclosure of medical error: Facts and fallacies”, Journal of Healthcare Risk Management, pgs. 67-76, Fall 2001. Bartlett, E. “Physician stress management: a new approach to reducing medical errors and liability risk”, ASHRM Journal, pgs. 3-7, Spring 2002. Nance, J. A tragic error, and a laudable response, http://www.seattlepi.com/local/opinion/article/A-tragic-error-and-a-laudable-response-1161411.php, accessed 12/14/04.